A sailor at the Norman Naval Air Station, A.L. Simon, illustrated a booklet “On The Beach” in 1944 about Navy life in Norman, Oklahoma. The title is ironic in that it reflects the odd notion that the United States Navy would establish two Navy bases in a southern prairie town in 1942. 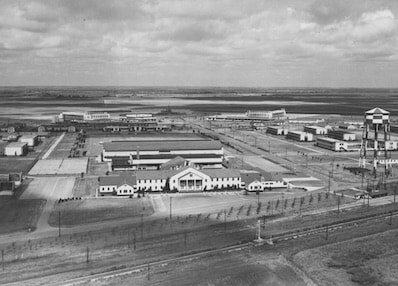 The activation of the Navy bases in 1942-1945, and reactivation in 1952 -1959, greatly increased Norman’s employment and economy. This was a much needed boost out of the Economic Depression of the 1930s. The men who influenced the Navy to choose Norman for Navy installations were T. Jack Foster, Norman Chamber of Commerce; Joseph Brandt, President of the University of Oklahoma; and Savoie Lottinville, Director of the University of Oklahoma Press. The story of Norman: World War II to 1959 is told through photographs and memorabilia housed in the Cleveland County Historical Society archive. Suzanne H. Schrems, PhD, and Lt. Col. Vernon R. Maddux, USMC (Ret.) are residents of Norman and board members of the Cleveland County Historical Society. Both are authors of books on Oklahoma and the American West, and the Arcadia book Norman, 1889-1949. The authors’ proceeds from this book go directly to the Cleveland County Historical Society and its support of Norman’s Moore-Lindsay Historic House Museum. Norman, 1889-1949 and Norman's Navy Years can be purchase at the Moore-Lindsay Historical House Museum or online by using the paypal link above. Both books are $15.00, if you buy online there is an extra $1.50 shipping. Thank you, all proceeds go to the Cleveland County Historical Society and the Society's upkeep of the Moore-Lindsay Historical House Museum.